The design of a website plays a vital role as it acts like the online face of a business. That is why it is imperative to frame websites that should be visually appealing, but also easy to use for customers. 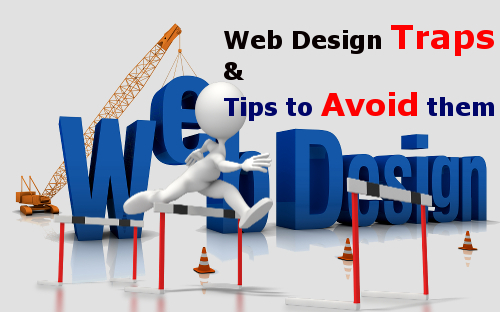 Today, we are going to throw light on the common web design mistakes and useful suggestions to avoid them. People are frightened of deceit and fraud. Thus, it is crucial for you to provide authentic and clear information on the website. Quick access to your contact number, business email, builds trust. Furthermore, an amiable support team works like an added bonus for your business. Every website in the world of internet exists for a specific reason. Whether it is to provide details, convey information, sell services/products, and so forth. Rotate your eyes over the design; the function of all the components should be crystal clear. Secondly, clickable things should be highlighted through styling as buttons, underlining etc. If visitors cannot find what they are looking for after two clicks, they’ll surely go away. Lack of Sitemaps, several unnecessary items (Pop up windows), back button that works badly, and other minute distractions are few mistakes that lead to the loss of potential clients in the long run. An attractive interface design will catch the attention of users, but they have to read the text to get the desired information. Some websites use a horrible style of fonts and sizes that makes reading painful for readers. Check color schemes of renowned sites and pay heed how their color schemes makes reading easy. A slow loading website gives visitors a strong reason to leave even in the first visit. Their initial interest sinks immediately. Even 5 seconds seems like a day for average people. Luckily, there are many ways to solve this issue like you can reduce the size of graphics and by removing those fancy add-ons and plug-ins. Balanced use of colors expresses your website pleasantly. Your website shouldn’t look like a big bunch of crayons. No doubt, colors, add fun, but an excess of anything is bad. Ensure all the colors work together to make your site striking and more usable for visitors. Images are undoubtedly the best ways to magnetize the attention of users. They can illustrate your services/products lucidly. By adding High-Quality Photos, you can improve your site’s user experience, decrease bounce rate and enhance your SEO. Thus, make sure you use high-quality photos of your products. Your site looks engaging and navigates impeccably. It may have quality content and a bunch of great photos. But it won’t do you any good if you are not telling different search engines what exactly you’re offering on each page of your site. Here you need to use the right keywords in the right places. Specific keywords should be in ALT tags, title tags, Meta tags, image captions, highlighted phrases, etc. Yes, social media is pervasive and popular, but most of the people are aware of only a few social media platforms. For example, if you use 20 social media accounts, then there’s no need to have a button to each account as most people only have the knowledge about Twitter, Facebook, Google+, LinkedIn, and that’s all. Using so many buttons will only mess up your website, distract visitors and slow down the load time. Finally, you’ve learned about those common slip-ups! Now concentrate on these mistakes and push up your prominence and sales.